This article is about a type of supernatural being in the Bible. For the winged infant figure in art, see putto. For other uses, see Cherub (disambiguation). A cherub (/ˈtʃɛrəb/; plural cherubim; Hebrew: כְּרוּב‎ kərūv, pl. כְּרוּבִים kərūvîm) is one of the unearthly beings who directly attend to God according to Abrahamic religions. The numerous depictions of cherubim assign to them many different roles; their original duty having been the protection of the Garden of Eden. In Jewish angelic hierarchy, cherubim have the ninth (second-lowest) rank in Maimonides' Mishneh Torah (12th century), and the third rank in Kabbalistic works such as Berit Menuchah (14th century). De Coelesti Hierarchia places them in the highest rank alongside Seraphim and Thrones. In the Book of Ezekiel and (at least some) Christian icons, the cherub is depicted as having two pairs of wings, and four faces: that of a lion (representative of all wild animals), an ox (domestic animals), a human (humanity), and an eagle (birds). Their legs were straight, the soles of their feet like the hooves of a bull, gleaming like polished brass. Later tradition ascribes to them a variety of physical appearances. Some early midrashic literature conceives of them as non-corporeal. In Western Christian tradition, cherubim have become associated with the putto (derived from classical Cupid/Eros), resulting in depictions of cherubim as small, plump, winged boys. In Islam, the cherubim are the angels closest to God. Joseph von Hammer-Purgstall noted Rūḥ as one of the most noble among the cherubim. Others are the Bearers of the Throne or the archangels. In Ismailism, there are seven cherubim, comparable to the Seven Archangels. Mythological hybrids are common in the art of the Ancient Near East. One example is the Babylonian lamassu or shedu, a protective spirit with a sphinx-like form, possessing the wings of an eagle, the body of a lion, and the head of a king. This was adopted largely in Phoenicia. The wings, because of their artistic beauty, soon became the most prominent part, and animals of various kinds were adorned with wings; consequently, wings were bestowed also upon man, thus forming the stereotypical image of an angel. Albright (1938) argued that "the winged lion with human head" found in Phoenicia and Canaan from the Late Bronze Age is "much more common than any other winged creature, so much so that its identification with the cherub is certain". 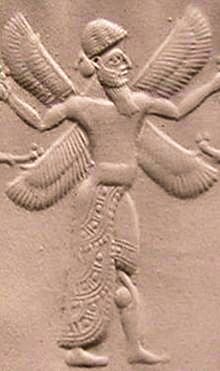 A possibly related source is the human-bodied Hittite griffin, which, unlike other griffins, appear almost always not as a fierce bird of prey, but seated in calm dignity, like an irresistible guardian of holy things; some have proposed that the word griffin (γρύψ) may be cognate with cherubim. The traditional Hebrew conception of cherubim as guardians of the Garden of Eden is backed by the Semitic belief of beings of superhuman power and devoid of human feelings, whose duty it was to represent the gods, and as guardians of their sanctuaries to repel intruders; these conceptions in turn are similar to an account found on Tablet 9 of the inscriptions found at Nimrud. It has been suggested that the image of cherubim as storm winds explains why they are described as being the chariot of Yahweh in Ezekiel's visions, the Books of Samuel, the parallel passages in the later Books of Chronicles, and passages in the early Psalms: for example "and he rode upon a cherub and did fly: and he was seen upon the wings of the wind." In particular, in a scene reminiscent of Ezekiel's dream, the Megiddo Ivories depict an unknown king being carried on his throne by hybrid winged-creatures. Delitzch (Assyrisches Handwörterbuch) connects the name it with Assyrian kirubu (a name of the shedu) and karabu ("great, mighty"). Karppe (1897) glosses Babylonian karâbu as "propitious" rather than "mighty". Dhorme (1926) connected the Hebrew name to Assyrian kāribu (diminutive kurību), a term used to refer to intercessory beings (and statues of such beings) that plead with the gods on behalf of humanity. The folk etymological connection to a Hebrew word for "youthful" is due to Abbahu (3rd century). The cherubim are the most frequently occurring heavenly creature in the Hebrew Bible, with the Hebrew word appearing 91 times. Despite these many references, the role of the cherubim is never explicitly elucidated. While Hebrew tradition must have conceived of the cherubim as guardians of the Garden of Eden (in which they guard the way to the Tree of life), they are often depicted as performing other roles; for example in the Book of Ezekiel, they transport Yahweh's throne. The cherub who appears in the "Song of David", a poem which occurs twice in the Hebrew Bible, in 2 Samuel 22 and Psalm 18, participates in Yahweh's theophany and is imagined as a vehicle upon which the deity descends to earth from heaven in order to rescue the speaker (see 2 Samuel 22:11, Psalm 18:10). 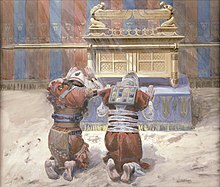 In Exodus 25:18-22, Yahweh tells Moses to make multiple images of cherubim at specific points around the Ark of the Covenant. Many appearances of the words cherub and cherubim in the Bible refer to the gold cherubim images on the mercy seat of the Ark, as well as images on the curtains of the Tabernacle and in Solomon's Temple, including two measuring ten cubits high. In Isaiah 37:16, Hezekiah prays, addressing Yahweh as "enthroned above the cherubim" (referring to the mercy seat). Cherubim feature at some length in the Book of Ezekiel. While they first appear in chapter one, in which they are transporting the throne of Yahweh by the river Chebar, they are not called cherubim until chapter 10. In Ezekiel 1:5-11 they are described as having the likeness of a man, and having four faces: that of a man, a lion (on the right side), and ox (on the left side), and an eagle. The four faces represent the four domains of God's rule: the man represents humanity; the lion, wild animals; the ox, domestic animals; and the eagle, birds. These faces peer out from the center of an array of four wings; these wings are joined to each other, two of these are stretched upward, and the other two cover their bodies. Under their wings are human hands; their legs are described as straight, and their feet like those of a calf, shining like polished brass. Between the creatures glowing coals that moved between them could be seen, their fire "went up and down", and lightning burst forth from it. The cherubs also moved like flashes of lightning. In Ezekiel chapter ten, another full description of the cherubim appears with slight differences in details. Three of the four faces are the same – man, lion and eagle – but where chapter one has the face of an ox, Ezekiel 10:14 says "face of a cherub." Ezekiel equates the cherubim of chapter ten with the living creatures of chapter one: "They were the same creatures (חיה) I had seen by the river Chebar" (Ezekiel 10:15) and "These were the living creatures I had seen under the God of Israel on the banks of the river Chebar" (Ezekiel 10:20). In Ezekiel 41:18-20, they are portrayed as having two faces, although this is probably because they are depicted in profile. The figures painted on the walls of the Herodian reconstruction of the Temple are called "cherubim" in the Babylonian Talmud. Many forms of Judaism include a belief in the existence of angels, including cherubim within the Jewish angelic hierarchy. The existence of angels is generally accepted within traditional rabbinic Judaism. There is, however, a wide range of beliefs within Judaism about what angels actually are and how literally one should interpret biblical passages associated with them. In Kabbalah there has long been a strong belief in cherubim, with the cherubim and other angels regarded as having mystical roles. 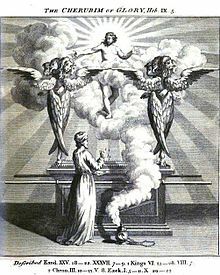 The Zohar, a highly significant collection of books in Jewish mysticism, states that the cherubim were led by one of their number named Kerubiel. On the other end of the philosophical spectrum is Maimonides, who had a neo-Aristotelian interpretation of the Bible. Maimonides writes that to the wise man, one sees that what the Bible and Talmud refer to as "angels" are actually allusions to the various laws of nature; they are the principles by which the physical universe operates. For he [the naive person] does not understand that the true majesty and power are in the bringing into being of forces which are active in a thing although they cannot be perceived by the senses... Thus the Sages reveal to the aware that the imaginative faculty is also called an angel; and the mind is called a cherub. How beautiful this will appear to the sophisticated mind, and how disturbing to the primitive." – The Guide for the Perplexed II:6. Maimonides says that the figures of the cherubim were placed in the sanctuary only to preserve among the people the belief in angels, there being two in order that the people might not be led to believe that they were the image of God. 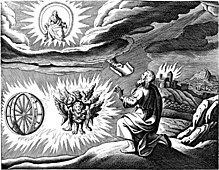 Cherubim are discussed within the midrash literature. The two cherubim placed by God at the entrance of paradise (Gen. iii. 24) were angels created on the third day, and therefore they had no definite shape; appearing either as men or women, or as spirits or angelic beings (Genesis Rabbah xxi., end). The cherubim were the first objects created in the universe (Tanna debe Eliyahu R., i. beginning). The following sentence of the Midrash is characteristic: "When a man sleeps, the body tells to the neshamah (soul) what it has done during the day; the neshamah then reports it to the nefesh (spirit), the nefesh to the angel, the angel to the cherub, and the cherub to the seraph, who then brings it before God" (Leviticus Rabbah xxii. ; Eccl. Rabbah x. 20). In early Jewish tradition there existed the notion that cherubim had youthful, human features, due to the etymologization of the name by Abbahu (3rd century). Before this, some early midrashic literature conceived of the cherubim as non-corporeal. In the first century AD, Josephus claimed: "No one can tell, or even conjecture, what was the shape of these Cherubim."(Antiquities:8:73). A midrash states that when Pharaoh pursued Israel at the Red Sea, God took a cherub from the wheels of His throne and flew to the spot, for God inspects the heavenly worlds while sitting on a cherub. The cherub, however, is "something not material," and is carried by God, not vice versa (Midr. Teh. xviii. 15; Canticles Rabbah i. 9). In the passages of the Talmud that describe the heavens and their inhabitants, the seraphim, ofannim, and living creatures are mentioned, but not the cherubim (Ḥag. 12b); and the ancient liturgy also mentions only these three classes. In the Talmud, Jose the Galilean holds that when the Birkat Hamazon (grace after meals) is recited by at least ten thousand seated at one meal, a special blessing, "Blessed is Ha-Shem our God, the God of Israel, who dwells between the Cherubim," is added to the regular liturgy. Baroque-era cherub from Scharten church, Upper Austria, Altar of the Crucifixion (1667). In Medieval theology, following the writings of Pseudo-Dionysius, the cherubim are the second highest rank in the angelic hierarchy, following the seraphim. Cherubim are regarded in traditional Christian angelology as angels of the second highest order of the ninefold celestial hierarchy.De Coelesti Hierarchia (ca. 5th century) lists them alongside Seraphim and Thrones. In Western art, cherubim became associated with the putto and the Greco-Roman god Cupid/Eros, with depictions as small, plump, winged boys. Artistic representations of cherubim in Early Christian and Byzantine art sometimes diverged from scriptural descriptions. The earliest known depiction of the tetramorph cherubim is the 5th-6th century apse mosaic found in the Thessalonian Church of Hosios David. This mosaic is an amalgamation of Ezekiel's visions in Ezekiel 1:4–28, Ezekiel 10:12, Isaiah's seraphim in Isaiah 6:13 and the six-winged creatures of Revelation from Revelation 4:2–10. 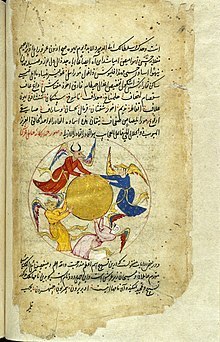 Cherubim (al-Karubiyyin) are not named in the Quran, but appear in Islamic traditions within the Miraj literature and Qisas Al-Anbiya. The Cherubim are commonly either in the sixth heaven or identified with the Bearers of the Throne. The cherubim continouesly praise God with the tasbih: "Glory to Allah!". They are described as bright as no one of the lower angels can envision them. In other traditions,[which?] the cherubim are described as being so bright that the light of one of them could suffice the whole world. When Moses asked God to show him his face, he made one of his cherubim shine upon the mountain, shattering it to pieces. According to this tradition, attributed to Jafar al Sadiq,[self-published source?] God was showing Moses that since he could not bear to look at a cherub, he would not be able to bear looking at God. ^ "cherub". Random House Webster's Unabridged Dictionary. ^ a b Kosior, Wojciech. "The Angel in the Hebrew Bible from the Statistic and Hermeneutic Perspectives. Some Remarks on the Interpolation Theory". The Polish Journal of Biblical Research. 12 (1 (23)): 56–57. Retrieved 1 December 2013. ^ a b c d e f Wood, Alice. Of Wing and Wheels: A Synthetic Study of the Biblical Cherubim. pp. 2–4. ISBN 978-3-11-020528-2. ^ a b c d e Wood, Alice. Of Wings and Wheels: A Synthetic Study of the Biblical Cherubim. p. 1. ISBN 978-3-11-020528-2. ^ Propp, William H. (2006). The Anchor Bible. 2A, Exodus 19-40. New York: Doubleday. Exodus 15:18, p. 386, Notes. ISBN 0-385-24693-5. which references Wellhausen, Julius (1885). Prolegomena to the History of Israel. Edinburgh, Scotland: Black. p. 304. ^ Beekes, Robert S. P. (2010). "γρυπος". Etymological Dictionary of Greek. 1. Leiden and Boston: Brill. p. 289. ISBN 978-90-04-17420-7. From the archaeological perspective, origin in Asia Minor (and the Near East: Elam) is very probable. ^ a b Wood, Alice (2008). Of Wings and Wheels: A synthetic study of the Biblical cherubim. Beihefte Zur Zeitschrift fur die Alttestamentliche Wissenschaft, Book 385. Walter de Gruyter. pp. 3–4. ISBN 978-3110205282. ^ Wood, Alice. Of Wings and Wheels: A Synthetic Study of the Biblical Cherubim. pp. 84–85. ^ "1 kings 6:23-6:35 KJV - And within the oracle he made two". Bible Gateway. Retrieved 2012-12-30. ^ Wood, Alice. Of Wings and Wheels: A Synthetic Study of the Biblical Cherubim. p. 94. ^ Wood, Alice. Of Wings and Wheels: A Synthetic Study of the Biblical Cherubim. p. 137. ^ Yoma 54a: "it had painted Cherubim, as it is written." ^ "Oxford Dictionaries: cherub". Oxford University Press. 2013. ^ Peers, Glenn (2001). Subtle bodies: representing angels in Byzantium. Berkeley: University of California press. ISBN 978-0-520-22405-6. Yaniv, Bracha, "The Cherubim on Torah Ark Valances", Jewish Art Department, Bar-Ilan University, published in Assaph: Studies in Art History, Vol. 4, 1999. R. Gilboa, "Cherubim: An Inquiry into an Enigma", Biblische Notizen, 82, 1996, 59–75. Wikimedia Commons has media related to Cherubs. "Cherubim" . Encyclopædia Britannica. 6 (11th ed.). 1911. pp. 86–87.